Cheju explores his trademark oriental style in his 3rd Boltfish ep - inspired by the temples, skyscrapers, zen gardens and amusement arcades of Japan.
" 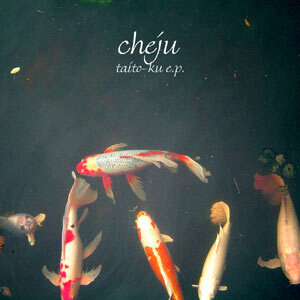 The Japanese themed "Taito-Ku EP" is Cheju's latest Boltfish release (Jul 2005) and it's a gem! Cheju starts off with "Pachinko" and the excellent sounds and gentle crisp beats it contains. "Flipchart Psychology" which is reminiscent of something that would fit an updated soundtrack of a Miami Vice TV episode, sound wise that is, follows "Pachinko". The third track "Bellflowerroot" with an excellent bassline is a clear favourite among the four tracks contained on this EP. The intro of heavily treated bells and the string-like bassline fused with clever yet straightforward-programmed beats works like a charm. The fourth and last track is entitled "Cloud garden" it got a dramatic intro leading onto deep bass frequencies combined with glitch moderately used. It's lovely sonic imagery created by the ever so talented artist named: Cheju." "Woh this release is good, Cheju has just torn up my mind and stitched it carefully back together adding colours and heightened memories throughout, this ep is outstanding in my opinion, real real REAL class." "... again its just sublime sounds. 'Pachinko' with far Eastern flavours and dramatic tones stretches out before your ears with stunning simplicity. 'Flipchart Psychology' is more industrial than the first track, with electro-filtered keys and tweeting bleeps mysteriously forming an Eastern mood. 'Bellflowerroot' opens with a real sense of moodiness. Dramatic chords and crackling touches build the sound into something hypnotic, before keys arrive and transport you to distant worlds. 'Cloud Garden' continues the quality, with more beautiful sounds and dreamy touches to enjoy."